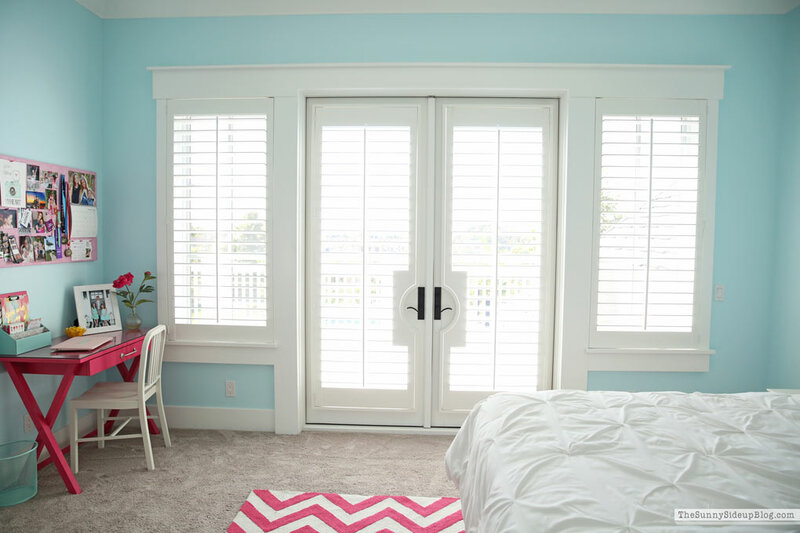 Sharing a few fun updates in Addison’s bedroom today! When we designed our house 5 years ago (has it really been that long!?) and I was thinking about my girls’ rooms and bathroom I never would have thought to put in a full length mirror for them. That’s because my girls were 7 and 9 at the time. Now they are 12 and 14 and care more about how they look than they do about how their dolls are dressed. (sigh) Things have changed a lot in the past 5 years! Ad has been begging for a full length mirror in her bedroom for a while now so we were beyond thrilled to find this beautiful Glam Floor Mirror at Walmart. They have so many fun options for kids’ spaces! It has an easel style stand and props up so easily. I love the beveled edge and it’s the perfect size for this corner of her bedroom. We added this cute Tropical Stripes Flamingo pillow and a hook to her wall where she can hang her outfit for the next day. 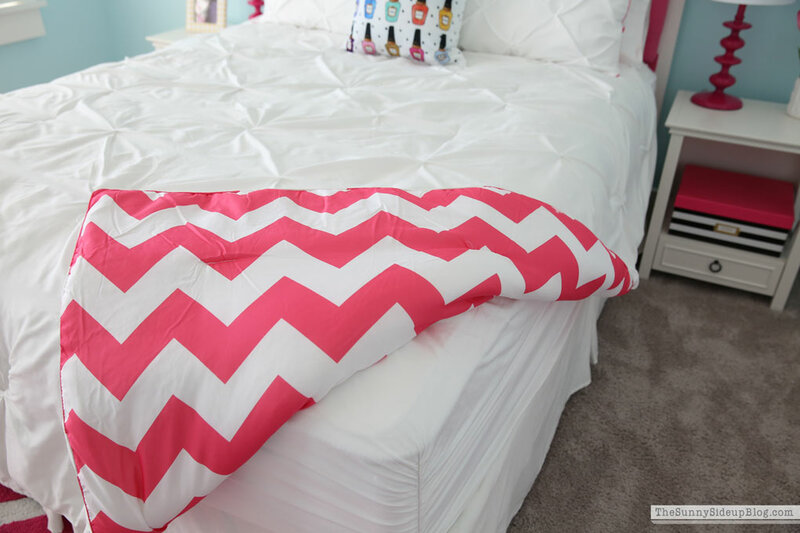 It’s reversible and has a fun chevron pattern on the other side. Plus it’s lightweight and perfect for fall in San Diego.. which pretty much feels like winter and spring and summer in San Diego. The nail polish pillow was a no brainer for this child. 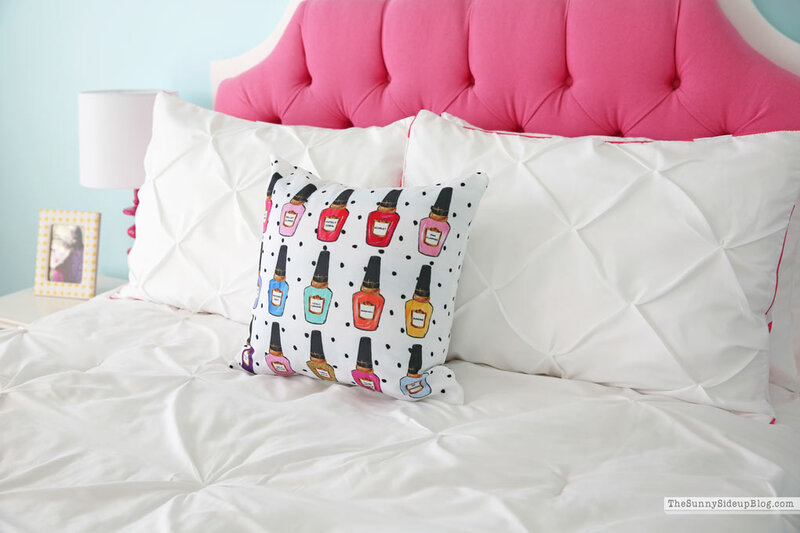 Her room feels so light and bright and clean with this new comforter! This side of her room still looks the same, but I have one other fun update on the wall by her door I’ll share soon! It’s still a work in progress. You can see my original post on Ad’s bedroom here. Simple updates bring a space back to life and feel so good don’t they? Huge thank you to Walmart for sponsoring this post! And for offering such cute, affordable decor for kids’ spaces. You’ve helped guarantee well coordinated outfits and good hair days in Addison’s future. In middle school.. you can’t get much better than that. Her room looks really cute. Love your new additions! I wish I had room in my bedroom for that mirror! Walmart has some great kitchen linens in the Pioneer Woman line. Very bright and colorful. This is such a beautiful room, Erin! I am pretty content with our master, but i would LOVE a sweet space like this to escape to and enjoy my chocolate after a long day. :) Haha! Such a great mix of colors and details. Thank you for sharing! Love this! Where is the headboard from? Hi Betty! It was custom made. Sorry that’s no help!